Elegant Escape and Thomas Patrick are currently 6/1 joint-favourites at the top of the Ladbrokes Trophy betting despite the former beating the latter when the pair clashed at Sandown in mid-November. Colin Tizzard’s six-year-old was headed after the last before coming back strongly to land the odds in that 3m, soft ground affair, giving Tom Lacey’s runner-up 2lbs and a half-length beating. So why are the pair neck and neck at the head of the current Ladbrokes Trophy betting? And why do we think Thomas Patrick can overturn that Sandown form to win Newbury’s Winter Carnival showpiece? Bet on the latest Ladbrokes Trophy odds with William Hill. Who will emerge as the winner in this Saturday’s Ladbrokes Trophy race at Newbury? Elegant Escape runs in the race under a 4lb penalty for his victory at Sandown, whereas Thomas Patrick, less than a length behind that day, runs off the same mark at the Berkshire circuit. That all adds up to a 5lb pull in the weights in the direction of Lacey’s up-and-comer, who will receive 7lbs from the Tizzard horse in the race formerly (and likely for some time to come) known as the Hennessey. The Tizzard gelding has raced eight times over fences to date, winning three of those outings, but over the course of his last four runs of last season, his official rating rose just 3lbs before falling 2lbs again. Although the handicapper has yet to evaluate either horse’s mark in the wake of his Sandown score, Lacey’s son of Winged Love has upped his OR 23lbs over the course of just five career runs over the larger obstacles, three of which were victorious. Of the co-favourites in the current Ladbrokes Trophy betting markets, the odds reflect that it’s Thomas Patrick that looks to have the greater potential for further improvement. 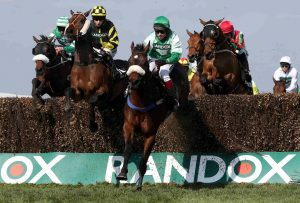 Thomas Patrick clears the last fence on the way to winning the 2018 Betway Handicap Chase during Grand National Day. A dozen of the last 16 winners of the race had previously competed at Newbury, with eight of those previously having scored over fences there. 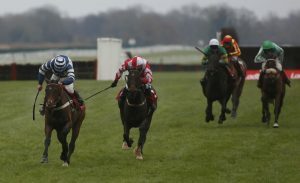 While Elegant Escape did finish a credible 7l fourth in a moderate quality 2016 renewal of the Grade 1 Challow Novices’ Hurdle at the track, that spin is arguably less compelling than Thomas Patrick’s success over the Ladbrokes Trophy trip there in March. He scored by eight lengths that day on just his third run over fences on soft ground he may well encounter again at Newbury should the rain persist between now and Saturday. Thomas Patrick followed up the aforementioned course and distance victory by making all to win a Grade 3 handicap chase over 3m1f at Aintree’s Grand National meeting, putting 15 rivals to the sword from the front, making him firm favourite to win in our Ladbrokes Trophy betting markets. While Elegant Escape won his maiden hurdle in a 14-runner affair, his jumping of a fence has never been tested in the hurly-burly of a sizeable field. The most rivals he’s ever faced over the large obstacles is nine, while all his chase victories have come in fields of five at most. Want to back the latest odds on Thomas Patrick to win the Ladbrokes Trophy, but don’t have a William Hill account? Click here to sign up using the promo code C30 and stake £10 to receive three £10 free bets.